This weekend I visited my best friend and his fiancee in Atlanta. 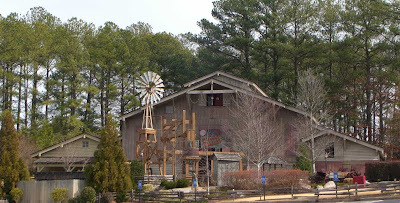 After visiting their new apartment, we headed out to Stone Mountain Park. 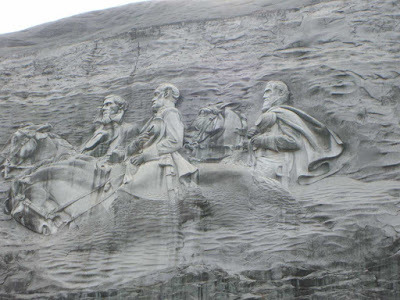 Just a 10 minute drive from Atlanta, off the 85 highway, lies a mountain, into which the portraits of the Confederate heroes were carved. I guess the artist aimed for a southern Mount Rushmore. 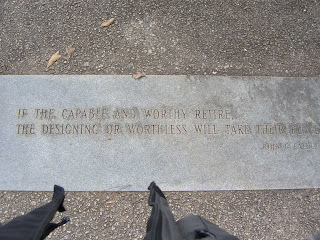 You don't have to be a confederate sympathizer to enjoy the park. Around the base of the mountain there are lakes, hiking, running and cycling courses, a hotel or two, a golf course and a theme park. 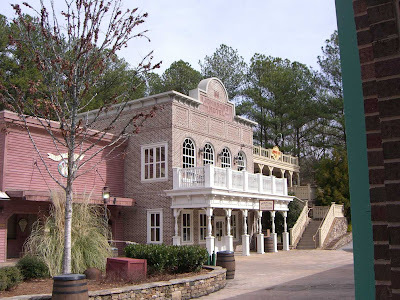 The theme revolves around an old-time, frontier type town, with the usual buildings, a train and some other facilities. to visit an empty theme park: no lines, no noise - just signs telling us the park will be back in business in March. So, instead of using the cable car, we hiked up the mountain. It's a mile long trail, with a mild incline. Grandmas, babies and puppies rushed up and down the mountain, making me feel all the more out of shape . It was just when we got to the mountain top that it hit me - where have I heard the name Stone Mountain before: in Martin Luther King's famous "I have a dream" speech. (Here's a link to the full, inspirational speech). From the top, on a clear day, you can see all of Atlanta and Buckhead. We also saw a flock of eagles - amazing view. At the base of the trail there's a a small geology museum, where we've learned how the mountain came to be. A great weekend excursion that left me wanting more. Wait for March and spend a weekend there to see what I mean. Photos from the trip can be found here.